A green, rechargeable battery that is suitable for powering electric vehicles and stationary power storage applications, and that would survive tens of thousands of charge cycles in a useful life of 100 years without loss of capacity. What could be a better innovation for our times? Such a battery has been developed, and recently improved by Stanford researchers. Oh, one other thing. 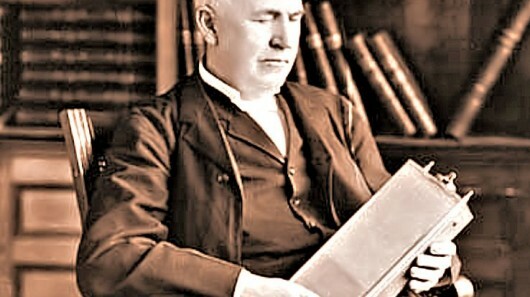 The battery was invented by Thomas Edison in 1901. The first era of electric cars took place from about 1890 until 1930. America’s first commercially successful electric vehicle was built by William Morrison of Des Moines, Iowa in 1891. In 1900, 28 percent of the cars built in the U.S. were electric. Generally these electric cars had low power motors – a kilowatt or two compared to the 15 kw of the 1908 Ford Model T. Their drivability, however, was acceptable because of the effortless starting of the electric motor, its large starting torque, and the perception that relatively slow electric cars were well suited to city driving by ladies and physicians (this was the era of the house call). An additional point was that the electric motor and drivetrain was far easier to build and required less precision machining than a system including an internal combustion engine – leading initially to lower cost and more manufacturers. These same manufacturers had to find a rechargeable battery to use. Initially, the only available rechargeable battery was the lead-acid battery, invented in 1859. Lead-acid batteries were used to store electricity in most electric cars until about 1900, when alternate batteries with competitive energy storage, power capacity, and cost began to be developed. Arguably the most popular of these alternate batteries was Thomas Edison’s nickel-iron battery. The strong points of the nickel-iron battery included a virtually unlimited useful life, a physical and chemical makeup enormously resistant to abuse, and a 42 percent increase in energy density. The weak points included higher cost as well as low voltage, power density, and charge rate. In combination, these weaknesses meant that a bank of nickel-iron batteries had about double the weight and volume as a set of lead-acid batteries of equal performance. The extra cost for a set of nickel-iron batteries for an electric car was US$600 – some $10,000 in current dollars. The competing batteries both held strong positions in the market until the gasoline engine improved to the point of clear superiority over electric cars. Then small lead-acid batteries won out as power sources for starting internal combustion engines, and nickel-iron batteries retained only a small position, mostly in stationary applications. The nickel-iron battery uses an electrolyte of potassium or sodium hydroxide and contains no lead or other heavy metals. It is therefore without risk of acid spills and its construction and disposal are largely without significant environmental damage. The density of the electrolyte does not change with the level of charge, as the electrolyte remains unchanged by the operation of the battery. The battery chemistry in a nickel-iron battery, during both charging and discharging, acts to transfer oxygen from one electrode to the other. This type of cell is sometimes called an oxygenlift cell, with the voltage generated by a change in oxidization potential between the electrodes. A group of researchers at Stanford has significantly improved the performance of nickel-iron batteries, which may lead to new applications for this venerable battery. The Stanford team has created an ultrafast nickel-iron battery that can be fully charged in about two minutes and discharged in less than 30 seconds, making the new batteries ideal to supplement slow-charging lithium-ion batteries in regenerative braking. To improve the performance of the nickel-iron battery, the Stanford team grew nanocrystals of iron oxide onto graphene sheets and nanocrystals of nickel hydroxide onto multi-walled carbon nanotubes. By doing so, they produced strong chemical bonding between the metal-containing nanocrystallites and the carbon nanostructures. The coupling of the carbon gives a low resistance pathway for electrical charges to move between the nanocrystallites (where the charging and discharging activity is taking place) and a device being powered by the battery. Stanford’s Professor Dai says, “the result is an ultrafast version of the nickel-iron battery that’s capable of charging and discharging in seconds.” Unlike lead-acid or lithium-ion batteries, nickel-iron batteries will neither explode nor catch fire at high charging/discharging rates. Details of the battery are published in the June 26 issue of the journal Nature Communications.